It is advisable to use only reputable taxis and if you are using a minicab ensure that you agree the fee beforehand. 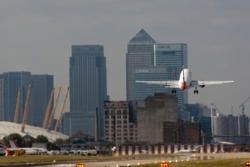 City Airport is situated to the east of London in the Docklands area. With its close proximity to Canary Wharf and The City it is an ideal airport for business travellers especially those travelling to or from Continental Europe. It is primarily used by short takeoff and landing airlines which makes it ideal for chartered planes and short haul routes to and from Europe. The airport served 3.2m passengers in 2008 which was an increase of 12% on 2007. London City airport is small compared to the other London airports. It mainly used by business travellers from London’s Docklands and financial district as well as tourists. The terminal facilities are also limited due to the size but this can be an added bonus. The time taken to check in or clear customs is considerably less than the other airports and this has led to the increased popularity of the airport as well as its central location to the financial districts. There are only 22 check-in desks and 14 gates at London City airport. There is also limited shopping available due to the size of the terminal. It has recently added WiFi throughout the terminal building and is the first Airport in the UK to offer this free service. The busiest time of the year are the winter months where a number of the airlines offer services to Ski resort destinations such as Zurich, Geneva, Milan and Strasbourg.